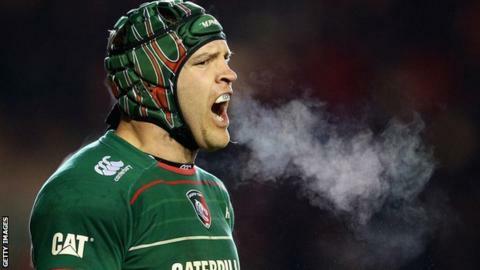 Australian flanker Julian Salvi will join Exeter Chiefs from Premiership rivals Leicester in the summer. Tigers director of rugby Richard Cockerill confirmed earlier this week that the 29-year-old would be leaving the club at the end of the season. "The more detail we went into, the better and better he looked," Exeter head coach Rob Baxter told BBC Devon. Salvi, who arrived at Leicester in 2011, will join former team-mate and England international Geoff Parling at Sandy Park next season. Both teams go into the final round of Premiership fixtures in the top four, though neither are guaranteed a place in the play-offs. "I've been very impressed with his form this season and very impressed with his durability," added Baxter. "I think he's going to be a fantastic role model for a few of our guys." Meanwhile Saracens have confirmed back rower Joel Conlon will join the club from Exeter. The England junior World Championship winner has made nine appearances for the Devon side.